The second generation Audi Q3. The new Q3 is available to order now. A second-generation model, the new Q3 is a compact family SUV which the German carmaker boasts offers unparalleled style, versatility and space for enhanced comfort. It has a starting on-the-road price of €39,600. 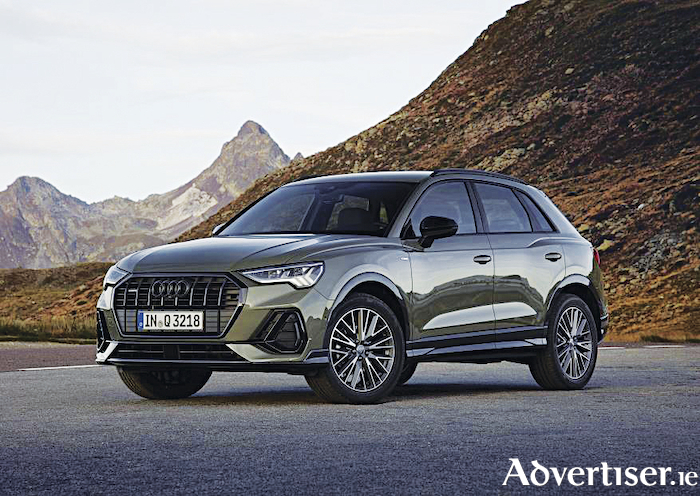 The new Audi Q3 also features a fully digital operating and display system, and what it describes as an extensive range of infotainment solutions and innovative driver assistance technology. It also earned a five stars result in the Euro NCAP safety test. Audi says that the Q3 comes with a number of active safety systems as standard and received five stars in the Euro NCAP safety test. Audi ‘pre-sense basic’ and ‘pre-sense front’, for example, provide the driver with a visual, audible and haptic warning when critical situations involving pedestrians, cyclists or other vehicles are detected. Also included as standard equipment is Audi side assist, which warns of hazards when changing lanes, as well as Audi active lane assist which helps ensure the SUV remains safely in its lane. If required, the car can also deploy automatic emergency braking. The new Q3 boasts a bolder new body with a sportier design than its predecessor. Its narrow LED headlights run inwards with a uniquely wedge-like shape for stylish illumination. The side view is enhanced by the 18-inch alloy wheels on SE and 19” alloy wheels on S line. It also has roof edge spoiler and aluminium roof rails. The MMI touch display and the virtual cockpit are standard and Audi claims they deliver an unrivalled driver experience. Compared with its predecessor, Audi says the Q3 has grown in virtually all dimensions. boasting a size of 4.485 metres long, 1.856 metres wide and 1.585 metres high. Audi claims the result offers the occupants considerably more knee room, headroom and elbow room. The promised increased room in the luggage compartment, which has an electric tailgate as standard, now totals 530 or 675 litres in size depending on the position of the rear seats and backrests. Audi boasts the new Q3 offers the same advanced technical functions as seen in Audi’s premium segments. It comes with Apple CarPlay and Android Auto as standard, bringing your smartphone apps onto the MMI. And it adds that the Q3 is even more tightly integrated with the myAudi app, with seamless connection to the driver’s smartphone and Audi eCall. The new Audi Q3 is available in both petrol and diesel units - in combination with either front-wheel or quattro drive. Progressive steering comes as standard. The power outputs will range from 150hp to 230hp, with four-cylinder direct injection units with turbocharging for a claimed powerful, refined and efficient drive. In off-road conditions, Audi says that the permanent all-wheel drive delivers an excellent driving experience, with optimal traction and unshakable stability. The driver can vary the characteristics of the Audi Q3 depending on the driving situation, road conditions or personal needs.